During the flood of Black Metal bands from Europe after the murdering of Euronymous (guitarist/leader of MAYHEM), that exposed Black Metal for all Metal fans of the world, we could finally have access to many works that we deeply hidden into underground. And let me tell you: I saw many kinds of atrocities (musically and even commercially speaking). Even for Black Metal, you have limits on some features that you must not transcend. If you do so, you’re so naive to need to show yourself as an extremist that you can release an album that only the most dumb of fans would hear. 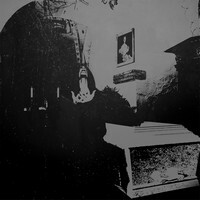 Sorry, but that the clear idea that “Church of Bones”, from PA VESH EN, from Belarus, gives. I really wanted to expend my time writing about a good Black metal band, but the insight this album was the expendable feeling of “mommy, I must sound as dirty and raw that no one can understand a thing of my music”. Yes, that’s the way, because even being a die-hard fan of Black Metal, I couldn’t understand nothing that is being played here. It’s not that I could understand the band’s music for being a kind of cult on underground but because the musicians extrapolated every single way what BEHERIT used on its earlier albums (that were done on that way due the lack of bad conditions on those days). On the production resides the greatest problem of “Church of Bones”. What in the blazes the producer wanted to do? Push every level of the mixing console on the limit? You barely understand a single arrangement on this confused sound mass. Nothing can be heard, just an endless confusion. Of course some extremists can say that my words are leading them, but as a comparison: even “Drawing Down the Moon” sounds like a super production in front of this album. I tried again and again, and with a lot of personal efforts and patience (and throwing time on the garbage can), I could understand enough to say that some good musical ideas exist on “A Funeral Procession” (as the rhythmic changes, or something like that), “La Valse Macabra”, the melancholic feeling of “Pale Body Desecration” and on “My Obscure Obsession”, but why in the blazes would a band make things so crude and filthy to turn the listening of their own album so hard? Ok, if you’re an extremist, you can buy a copy of “Church of Bones”, but I’m sure you won’t hear it a second time, if you can hear it completely once!